Bass guitar players are often perceived to be less important than the vocalist, drummer, and lead guitarist. In reality, a bass player has to have an entirely different attitude about the music. A bass player doesn’t have to be flashy or loud, but a band won’t survive long with a weak bass. Don’t miss all our complete series of lessons called Bass for Beginners. Why would I choose to play bass over guitar? The problem with starting with the bass is that it is not a very good instrument to play by yourself. Many bassists I know started because their band needed a bass player. Most would never go back. Since you love lots of music, and I assume you sing, I think you would get more pleasure from the guitar (or piano). However, you can play more than one instrument, it just takes a little more effort (and money). On the flip side, there is nothing wrong with starting on the bass (or flute or violin), and it is pretty easy to become a solid beginner in a short time. And it is satisfying to make those warm tones and low growls. So make your choice according to what your goals are. Either way – you win! How do I change the strings on a bass guitar? Step 1: Open the pack of new strings. Notice that they have a size or gauge labeled on each sleeve. The biggest (thickest) string is the E string, and the next smaller is A, followed by D, and the thinnest is the G. Write the name of each string on the sleeve. Step 2: Unpack the new D string and examine each end. One end will have a bead or loop, the other will have come thread covering the wires. Step 3: Turn the tuning head on your bass to loosen the D string. Step 4: Continue to loosen the D string until it comes off the tuning head. Notice how the string was inserted into the tuning head. Step 5: Remove the string from the guitar by pulling it through the hole in the bridge. This may be on the front or rear of the bass body. Step 6: Insert the new string in the same hole. Pull it all the way through until the ball or bead seats on the bridge. Step 7: Extend the string up to the tuning head. Measure 4-5 inches past the tuner and cut the string. Step 8: Insert the string into the tuning head the same way that the old string was there. Hold the string against the body and turn the tuner until the string becomes straight but still floppy. Step 9: Remove the other 3 strings. Step 10: Repeat steps 5-7 for each string. Step 11: Gently increase the tension on each string until the strings are no longer resting on the neck. Step 12: Using a tuner, tune all of the strings up to their correct note. Use the following sequence: D-A-G-E. Step 13: Re-tune each string again. You will also have to tune them a few times until they “get used to” the tension. What are the notes on a bass guitar? Learning all the notes on your bass fretboard is an important early step for the beginning bassist. Knowing where all the notes are will help you while playing along with others and improvising. This chart shows all the notes on your bass’ fretboard up to the twelfth fret. After the twelfth fret the notes repeat in the same order. Here are the bass notes (from the bass clef) and their TAB counterparts. What would I gain/lose from a fretless bass? The bass player I looked up to in college had a shirt that said “Fretless and Free!”, so that’s where I got my first interest in this. I have a fretted P-bass, and a fretless J-bass, so some of the tone differences are due to the pickups more than anything, but the tones that come from a fretless are still different. The way your fingertip pinches the string against the fretboard dampens the highest overtones without disturbing the middle ones, so you get a “warm” sound that is not “dull”. My column Tone Loco discusses this in more detail. I play fretless when I want the specific tone, or I want to slide. I play fretted when I’m playing fast rock&roll and I want to be sure I stay in tune at speed. I will change basses during a set, or re-arrange the song list so I don’t have to change as often. If I play a “fretless” song on my fretted bass (or vice versa), it feels weird, but I can adjust quickly. I will also play the fretted bass when I’m tired. If you have a good ear (which I don’t), then you might find the fretless more fun. If you play jazz or folk/rock, fretless is fine. If you’re a heavy hitting rock and roller, I’d get frets. Just as the advanced guitarist may own a Strat and a Les Paul, the advanced bassist may own both types of basses. 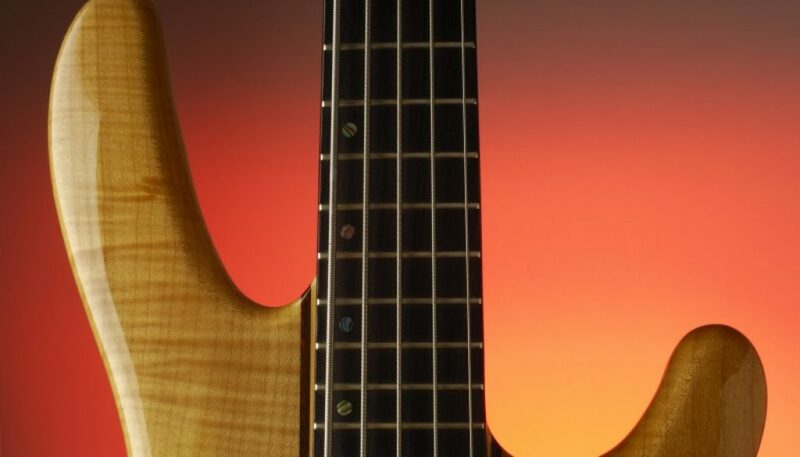 To find out more about the fretless bass check out Fretless and Free. Bono Tip: What do you need help with? Tweet it to us at @guitarnoise1 and we’ll see what we can do. Guitar Noise is a completely free website run by the dynamic duo of David Hodge and Paul Hackett. Stop by the forums to ask us a question.